Can’t believe we’ve reached this point of the season so soon. The penultimate book and film review for 2015 in this duo post series of ours. Naturally falling right before “The Slide”. What I coined a few years back, the cosmic phenomenon marking the beginning of the end for whatever year we happen to be living through. The space/time continuum accelerating to the point it’s all suddenly over, everything that happen between now and the end of the Rose Parade just a blur. A fleeting memory. Luckily, we’ll distract ourselves from this by examining another work of Michael Crichton‘s. Coincidentally, his fourth novel and our fourth joint review of his. Eaters of the Dead1 his second straight novel, after The Great Train Robbery, to go at right angles from his first two techno-thrillers (The Andromeda Strain and The Terminal Man) and into historical fiction. As in his debut novel, the author fabricated an elaborate story by archaic manuscript and ancillary info centered around the real life Ahmed Ibn Fadlan and his historic travels north from the Middle East. A brief synopsis of the film: It’s 922 AD and Ahmad ibn Fadlan, the poet to the Caliph of Baghdad, has run afoul of the court care of an amorous fling with another’s wife. Sent as an ambassador to trade with Northern barbarians, he encounters the notorious Vikings on his travels. Appalled by their customs — the gratuitous sexuality of their women, their disregard for cleanliness, and their cold-blooded sacrifices — he finds himself unwillingly enlisted to a group of twelve warriors on their journey back to help a Norse king. One besieged by an ancient evil that terrors the night and slaughters men, women, and children. How they’ll vanquish the monsters of the mist that devour human flesh, and come out alive, Fadlan has no idea. As one of my picks for the year, I have to say I’ve been looking forward to this. Having initially read Eaters of the Dead back in the ’70s, it was one of those that stirred my curiosity toward history and other cultures. Granted, the last time I’d navigated a crisscrossing of Vikings and those of the Muslim faith it was a decade earlier. Sitting on my grandmother’s lounger late one Saturday night while entranced with The Long Ships (1964). Eaters… film adaptation far from that, and yet ultimately closer in other ways. The box office failure of John McTiernan‘s The 13th Warrior, back before Y2K briefly gathered our thoughts, seemed to be a testament to what the film studio system had evolved to. Previewing what we’ve now. It’s far from being a Heaven’s Gate artistically, though close financially. Yet strangely, much like that film, it’s one that has enjoyed a curious resurgence. Certainly, amongst a group of genre fans — those with ‘Y’ chromosomes mainly — myself included. Okay, I like this better than Cimino’s epic western, too. So? I say that even as I acknowledge the film adaptation of Eaters of the Dead can be a bit frustrating to encounter. Principally, the first time. More so, if you’re familiar with the source material. Fans of the premier action-thriller director of previous years (Predator, Die Hard, and The Hunt for Red October, which we reviewed on 2011’s Slide Eve), were left scratching their heads with this, I’m sure. Well, those few who actually saw it first-run, that is. To say it suffers from inconsistent editing is putting it mildly. No doubt, made viewers wonder what was left on the cutting room floor2. Nevertheless, when the inquisitive go looking, they discover McTiernan’s initial stab at the story, care of a translation by William Wisher, Jr. and Warren Lewis, left the studio less than pleased. 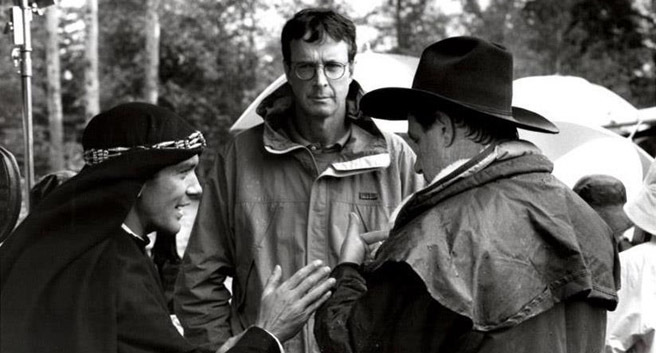 Author and fellow producer Michael Crichton took over the direction of re-shoots to reclaim it and his story3. The inconsistent result is what we’re left with all these years later. That said, I steadfastly maintain a sense of warmth toward The 13th Warrior. My fellow warriors out there reading this know exactly what I mean. For all the studio inference then, something today that seems way too common (especially with big money productions4), this snakebitten film somehow still blossomed during key points in the tale. Captured the manly sentimentality of battling a formidable foe and long odds. Innately protecting something dear, with those you’ve come to admire, even love, fighting alongside, registers epically on the ol’ testosterone meter, I reckon. Only way I can explain the feeling I get by the time Buliwyf’s dog heralds the film’s final outcome. Even for an action film, and this was more that than a serious look at cultural customs and differences between distinct peoples, it had that humorous camaraderie we’d expect from a McTiernan project. His hallmark dolly shots swept across scenes zestfully, enlivening the fighting and mayhem of the moment — Peter Menzies Jr. lensing some gorgeous Canadian vistas standing in for Norway. All married to the gritty, rain-soaked, blood-drenched ground much like Predator was to its jungle terrain, albeit in colder climate. A Spaniard portraying an Arab, with a Czech, a Scot, an Austrian, various Americans, joining a Dane and Norwegian as “Vikings”, with British Columbia standing in for the Norse land. Typical American production, in other words. Even its cast manifested itself well, which is saying something for a $100+ million film littered with mostly unknown “Nordic”-looking actors in support of the featured “names”. Antonio Banderas as “Ibn”5 coming off breakthrough success (The Mask of Zorro), conveying the best reaction shots throughout the film, and the somewhat wasted Diane Venora. 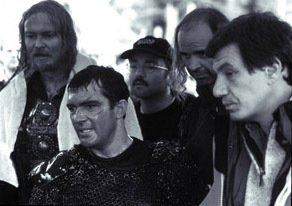 Despite that, the film’s real heart lies with the stoic Vladimir Kulich as Buliwyf and his boisterous lieutenant Herger (portrayed fabulously by Dennis Storhøi). Had to know the studio expected big returns, and just couldn’t get them no matter what they did to “fix” it. Odds-on, the viewing public will never see John McTiernan’s version of The 13th Warrior, though I’d pay good money to catch his director’s cut. His later conviction of perjury and lying to a FBI investigator, subsequent imprisonment, along with the bankruptcy that followed, makes that highly unlikely. Still, the film brought out enough of the author’s original story, along with the intrinsic emotional muscularity McTiernan was known for, to suspend viewer belief enough to enjoy this distillation to film. Namely, if they give it a chance, or at least another look. While the early CGI briefly employed will instantly date it with today’s audience, its storytelling, practical effects, and glorious massed clashes will make up for what ails it as the Viking warriors grapple those in the mist on their home turf. At least for us diehards. Coupled with another characteristically rousing Jerry Goldsmith score, who was brought in during the regime change6, it’s still a worthy adventure vehicle. Like its rowdy predecessors, The Vikings (1958) and The Long Ships, it delivers spiritedly in its own peculiar way. In any case, Ibn’s journey and words still ring true…for us guys especially. Good review. At the time it came out on video I used to hang out at my local comic shop a lot and being the first place in the city to ever rent dvds, he used to play this on a loop all the time. I think I’ve seen it at least a hundred times. I’ll probably never watch it again, but I didn’t mind it. Not a film I’ve seen for years and years. I’ll be honest, I was probably never going to revisit this but thank you for the look back. Well, you’ve convinced me; I will go watch this again. 😉 I saw this in the theatre and did not come out feeling I got my money’s worth. Admittedly, I was a big fan of the recording of an experience way the book was written and that device was not at all used in the film… along with all the other problems. Thanks for convincing me to re-visit this one!